Bicycles have always been the most cherished and relaxing modes of transport. 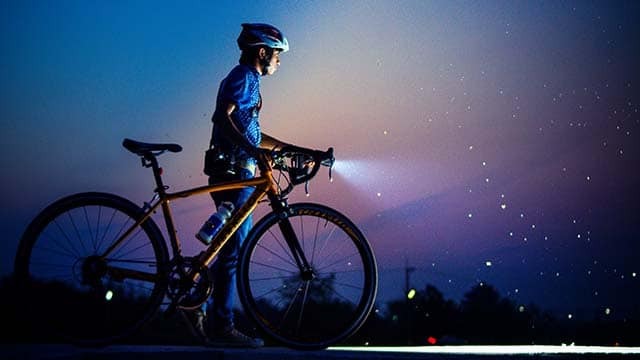 Whether you ride a bike to work, school, or whether you ride on your treks, bicycles are indeed, an important part of our lives. Designed initially just for the men, the bicycle companies have changed their perspective and are now designing bikes for men and women alike. Sixthreezero, one of the biggest bicycle companies in world, has come up with a hybrid bike for women. Sixthreezero EVRYjourney Women’s Hybrid Bicycle is a perfect combination of elegance, class, convenience, and cool. The utterly dynamic bicycle has been designed to provide comfort to women of all ages and size. The bike is full of new features and can be customized as per the needs of different women. Want to know whether this bike would be perfect for you? Read out our full review to make an informed decision. Adult riders in the range of 5-feet to 6-feet height. The Sixthreezero EVRYjourney Women’s Hybrid Bike’s sleek design and stability make it apt for cruise, leisure, and commute riding. 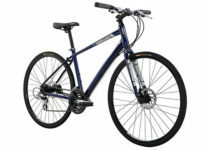 The bicycle comes with 26-inch wheels which are 2-inches wide and semi slick making it safe and stable for all trails. The 7-speed hub comes with full fenders to provide maximum comfort while riding. The bike is designed in such a manner that the rider sits more upright and naturally so as to not strain the back. It is fitted with a foot-forward seat that allows the riders to put their foot on the ground without leaving the seat. This, along with the lower frame of bicycle makes it convenient for people of different heights to use. It helps women to easily get on and off the bicycle. The lower center of gravity makes the bike exceptionally light and thus, apt for longer rides. The bike comes 80% assembled with lightweight alloy wheels of semi-slick material. One doesn’t need to be a technical pro in order to assemble the rest of the bike. The only parts needed assembling are pedals, saddle, front wheel, and handle bars. The wheels are 26-inches in diameter and 2-inches wide that help maintaining the stability of the vehicle on difficult terrains. The seat of the bike is made with soft foam that gives you a cushioned feel while riding. The extra-wide saddle settles in for maximum comfort. This keeps the rider comfortable and upright throughout their journey. The forward pedaling system of the bike makes up for comfortable ride and retains the natural posture of one’s body. 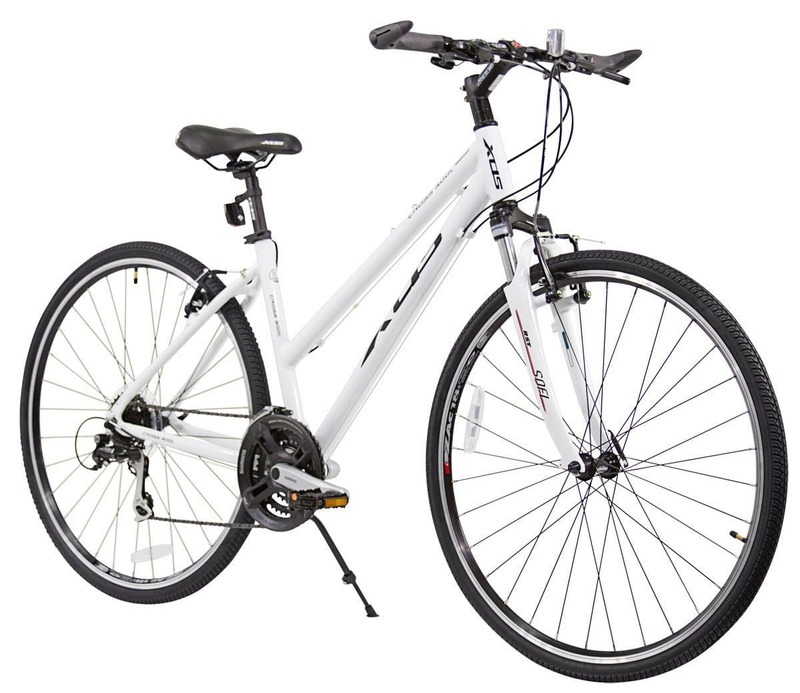 The Sixthreezero EVRYjourney Women’s Hybrid Bike is fitted with rear and front brakes to make it suitable for both long rides. As well as leisurely strolls. It has a quick release post clamp and front wheel that make your ride very safe. One can go up to 40 miles per hour in this bike with ease. Comfort is the real deal when it comes to Sixthreezero EVRYjourney Women’s Hybrid Bike. Thus, its handle grip is made out of soft leather for comfortable grip. One can go for long distances without ever straining their hands or back on this bicycle. The lower handlebar also makes it very easy to handle this bike and makes it for a breezy ride. Strong and lightweight aluminum frame. Suitable for people with different heights. Allows speed of up to 40 miles per hour. Designed for a range of riding experience. The bike comes 80% assembled and rest 20% needs to be done. Lower frame may not be suitable for very tall women. The bike is designed especially to fit the frame and structure of a woman rider. The multipurpose bicycle is fit for leisurely strolls, daily commutes, and longer rides. Despite that it comes only 80% assembled, only the smallest parts of it need assembling with minimal technique for it to ready to go. The Sixthreezero EVRYjourney Women’s Hybrid Bike is highly focused on providing comfort to the woman rider. This includes a soft leather grip and wide cushion saddle to make up for long rides. The design also helps keep the natural position while riding and is suitable for a wide range of heights. Thus, the bik makes for an adequate buy. A. Yes, the bike has 26-inch alloy wheels that make it suitable for riding on different trails. Q. Is it suitable for longer rides? A. The 7-speed hybrid hub of the bike makes it convenient for longer distances and different kinds of roads. A. The lower structure of the bike helps makes it suitable for women of varying heights. Women ranging for 5-feet to 6-feet tall can easily ride the bike. Q. Is it well designed for taller women? Q. Does it come fully assembled? A. No, the bike only comes 80% assembled. The pedals, saddle, front wheel, and handle bars need to be assembled after its delivery. The Sixthreezero EVRYjourney Women’s Hybrid Bike focuses heavily on the comfort of the women with this bike. The bicycle gives exactly what it promises with speed, lightweight, and comfortable features throughout. The sleek and elegant design also makes it a pretty ride along with a functional one. Despite its price and only 80% assembled delivery, it’s a good deal. One can consider buying this for sheer comfort and functionality it provides. 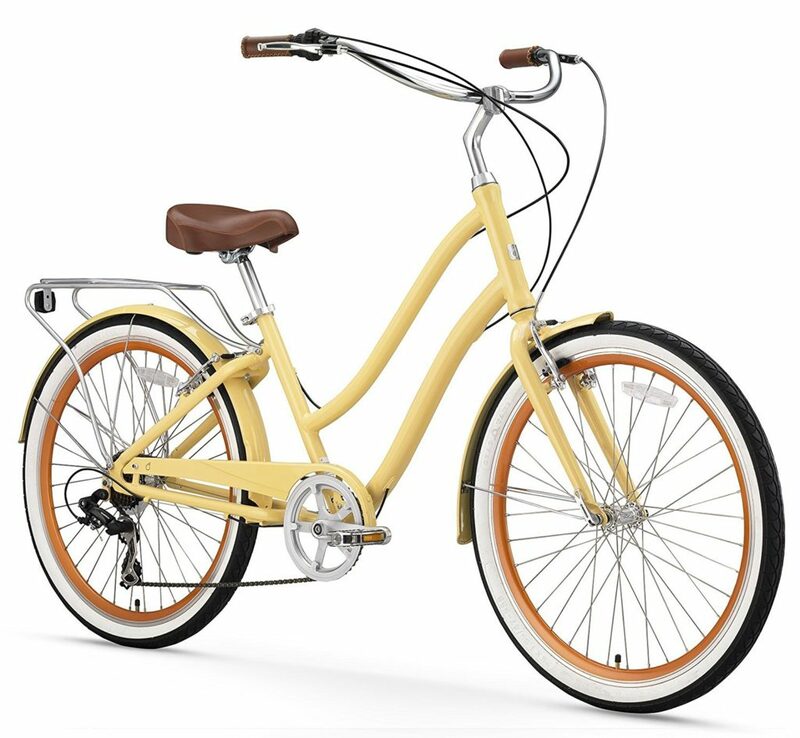 With regards to cruiser bikes they can easily be distinguished from other bikes by their retro, dropdown and curved handlebars, contoured frames plus large seats. It evolved out of the need of a specific section of cyclist who desire to have ergonomically designed bicycle.